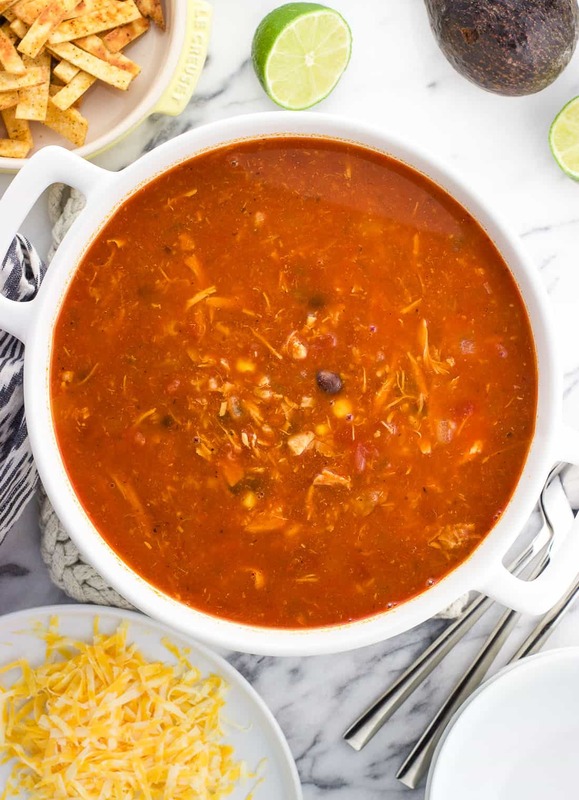 Easy chicken tortilla soup with rice is filled with bold southwestern flavors and on the table in forty minutes. 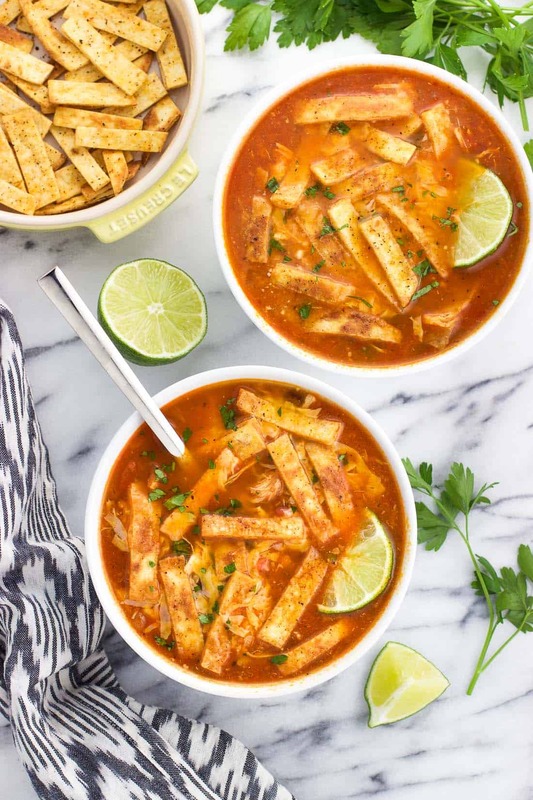 Top this healthy soup recipe with tortilla strips, cheese, and a sprinkling of lime juice for a delicious main dish recipe. 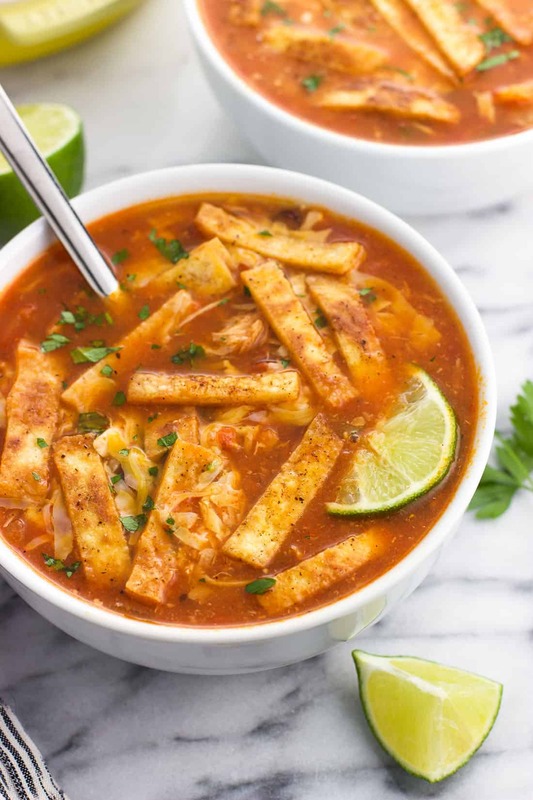 I may be trying to will soup weather into existence right now, but this easy chicken tortilla soup with rice is worth it. 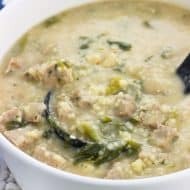 Most recently last month we talked about how soup isn’t exactly the first thing you’d think to make when it’s hot outside, though there are those among us (like me!) who ignore the thermometer and barrel ahead with soup on our menus. 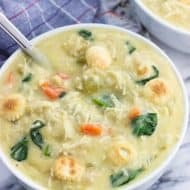 Soup is usually healthy (or healthier), not crazy involved to make, and yields a fair amount of leftover portions for lunches and/or stocking the freezer. Hard to beat those qualities, even if you have to put a fan on or drop the A/C down a degree to eat it. 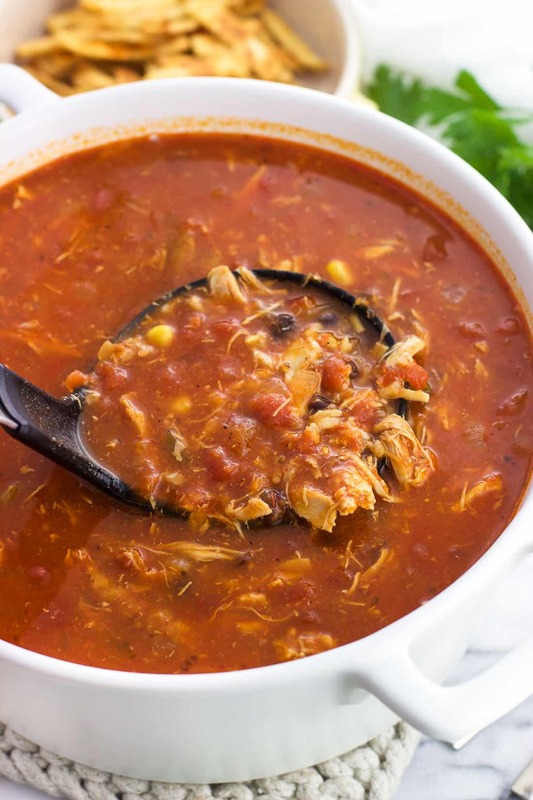 This easy chicken tortilla soup recipe has some base similarities as this Italian sausage soup, using a combination of reduced-sodium chicken broth, crushed tomatoes, and water for the liquid. Here though I sauteed a jalapeno pepper along with the onion for not so much a kick but some southwestern flavor. Our backyard jalapeno plant has been doing really well which is GREAT, but it’s been tough to stay on top of picking and using them before they start to turn black, and then red. Yikes. But if you’re concerned about this soup being spicy, don’t be. I’ve found sautéing the jalapenos mellows out the spice nicely, which is what happens here. It might be a little extra, but I’m firmly in the “better safe than sorry” camp when it comes to handling jalapenos, so I recommend using disposable kitchen gloves for the slicing and dicing. Plus they come in handy when mixing things with your hands like meatballs. So many uses for them besides cleaning. The “easy” in the title is referring to, among other things, the chicken in this soup. 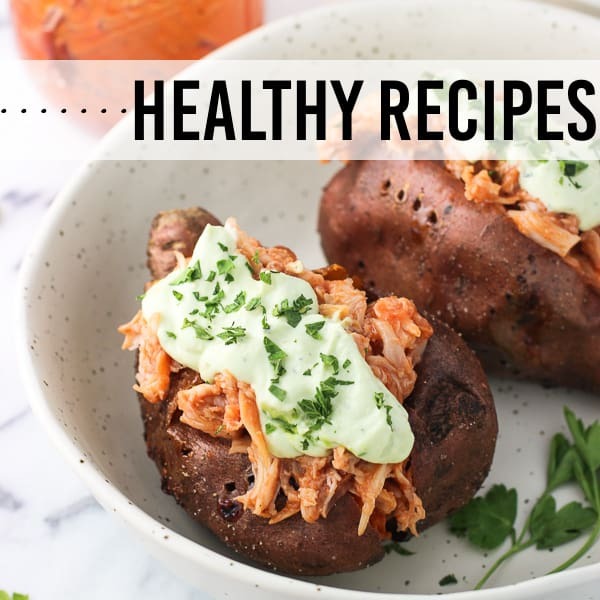 I used cooked, shredded chicken here to cut out a few steps. AKA my favorite chicken shortcut ever, a rotisserie chicken. How many cups of chicken are in a rotisserie chicken? Of course your mileage may vary, but I measured that you can get approximately four cups of shredded chicken out of a rotisserie chicken. 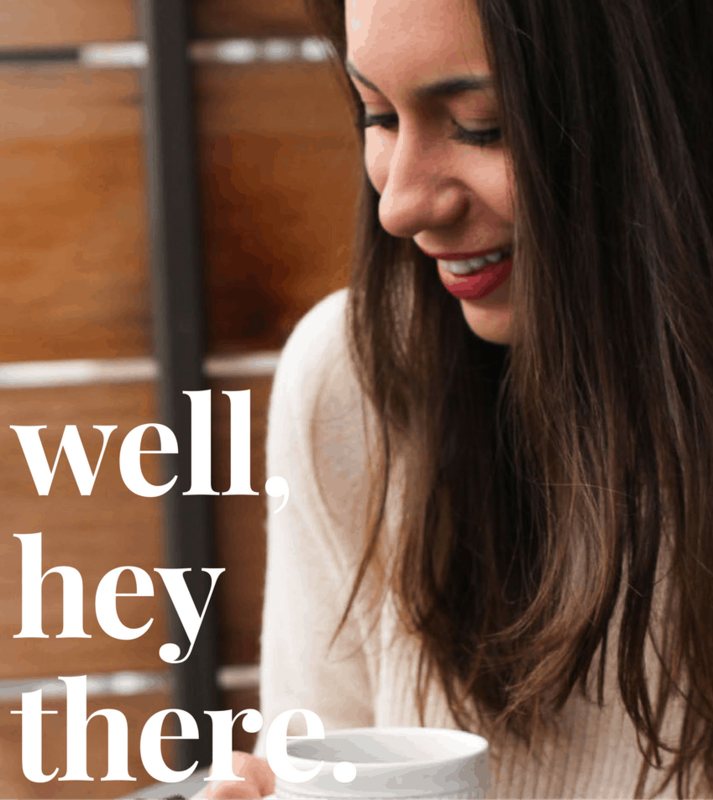 So this recipe calls for four cups. If your chicken is bigger or smaller it doesn’t really matter as there’s a ton of wiggle room. Just add as much (or as little) as you like. Four cups felt like a balanced amount without chicken overwhelming every spoonful. 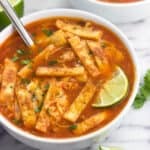 This easy chicken tortilla soup with rice would also work great with leftover grilled/cooked chicken breasts. 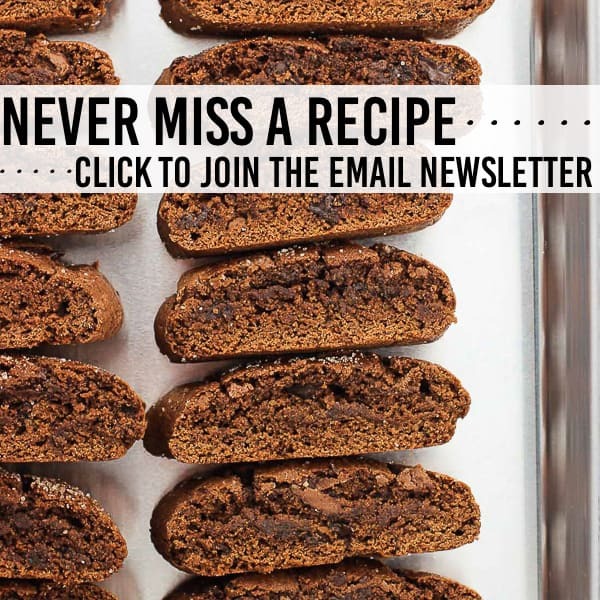 Just shred or slice them up thinly and substitute away. 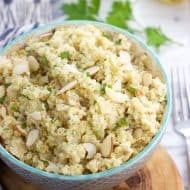 How do I make tortilla strips? There are store-bought varieties, however I love making them at home. All you need are tortillas, oil, and spices. The ones you see in these photos are these baked tortilla strips seasoned simply with salt and pepper. I always find myself with a stray tortilla or two or three that I don’t know what to do with after making tacos or enchiladas, so I’ve turned to making them into crisp and baked strips. In addition to soups, they make a delicious crouton-alternative on salads. Plus you can easily switch up the seasonings to fit them into whatever cuisine you like. 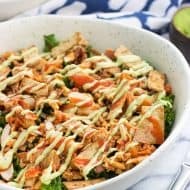 (Store-bought or) homemade ranch seasoning is a great complement to a buffalo chicken kale salad. 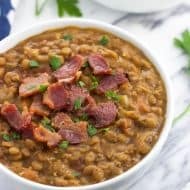 The toppings really make this soup! What you see here are tortilla strips, shredded cheese, and cilantro, with a drizzle of lime from the lime wedge. Do your own thing…a dollop of sour cream would work, too. The rice is a little shy in these pics but it’s there. 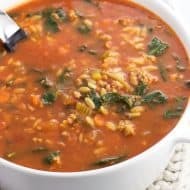 Long grain brown rice bumps up the nutrition and is a hearty addition to this healthy soup. I kept the amount of dry rice conservative so it didn’t blow up and overwhelm leftover soup portions, but feel free to increase the quantity if you like a lot of rice in your soup. The tortilla strips can be made a day or several days in advance to cut down on prep time the day of. Shredding the chicken ahead of time also helps keep things lean time-wise. 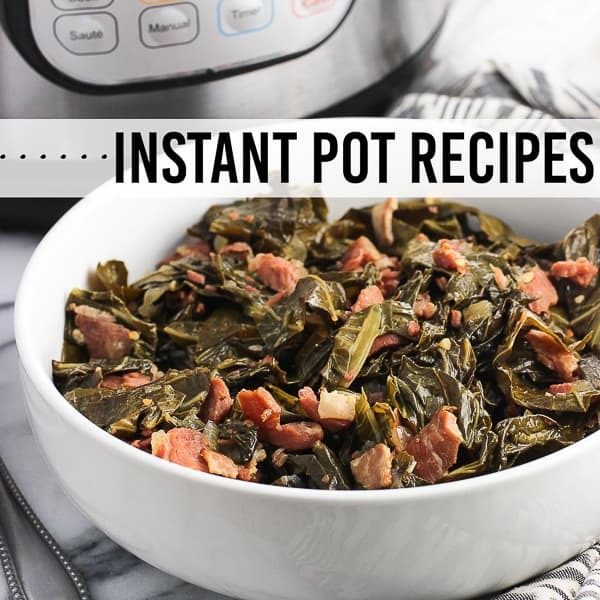 Place a heavy-bottomed pot on the stove over medium heat. Add olive oil and once heated add onion, garlic, and jalapeno. Saute for 2-3 minutes, or until onion is just becoming golden. Add chili powder, cumin, oregano, pepper, and salt and stir. Pour in broth, crushed tomatoes, water, diced tomatoes, chicken, black beans, and corn. Raise heat to a boil. Once boiling, stir in rice. Reduce heat to a simmer and cook for 30 minutes, or until the rice is tender, stirring occasionally. Serve with tortilla strips, shredded cheese, cilantro, and lime wedges. The nutritional info is an estimate for the soup only, not including any toppings you want to add. The jalapeno is added without seeds and sauteed for a mellower flavor. As written this recipe isn't spicy. Leave the seeds in or add more jalapeno peppers for a spicier soup if you like! To keep things simple measuring wise, I use the empty 28-oz can of crushed tomatoes to measure the water here. It doesn't have to be precise - just fill it as full as you can without risking a spill on the way from the sink to the stove.